Surrounded by a flowered garden 600 metres from the beach of Plaka, the Cycladic-style Mateus offers air-conditioned studios overlooking the Aegean Sea or the greenery. Shops, bars and restaurants are within a 15-minute walk. A kitchenette with fridge and dining area is included in all units at the Mateus Studios. Each has a TV and private bathroom with a bath or shower. Some studios offer a balcony while others have a patio. A children’s playground is provided in the garden for younger guests. Free Wi-Fi access is possible in public areas. 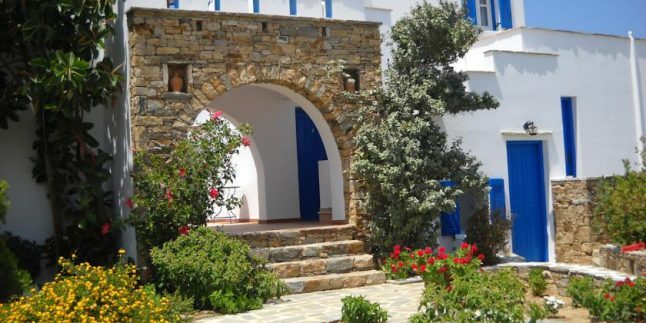 Mateus Studios is 5 km from Naxos Airport. Naxos Town is within 7 km. Staff can arrange car rental and free private parking is available at the property.